The New York Yankees go for the series win in game number four against Cleveland, trying to maintain lead over Boston for first place in the American League East. 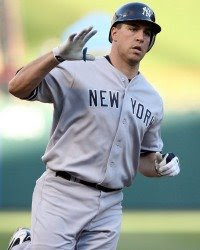 New York came back from a four run deficit Sunday, thanks to Mark Teixeira’s four runs batted in. Teixeira now has a 13-game hitting streak, off a bad start and is hitting .400 (22 for 55) with eight homers and 20 RBIs during his streak. However, a lead off walk by reliever Phil Coke ended up setting the table for Cleveland’s Jhonny Peralta, who drove in the winning run with his third hit of the day giving the Indians a 5-4 walk-off win. New York has won the last six times they have played in Game 4 of a series and they have captured 14 of last 18 tilts during this run. With Chamberlain on the mound, the Yanks are 8-2 against teams with losing records and 13-4 when favored. Cleveland (22-30, -8.8) will counter Jeremy Sowers (1-2, 7.71) who returns to the starting rotation. Sowers was dreadful with 0-2 record and 12.00 ERA, in two spot starts in May. He redeemed himself in part last Monday, tossing five scoreless innings in relief, in unfathomable 11-10 win against Tampa Bay. That was the left-hander’s first career stint out of the bullpen. Sowers and the Tribe are 1-6 when he starts the game versus a team with winning record. The early line from DiamondSportsbook.com has New York as -160 money line favorites with the total Un10. The Bronx Bombers are 7-1 against lefty starters, with matching record on the road if total is between 9 and 10.5 runs. Cleveland, despite their troubles this campaign, is 10-4 as home underdogs, though 6-15 in that role if Sowers is pitcher. The Yankees are 7-3-1 OVER when Chamberlain toes the rubber and the Indians are 20-7 OVER as underdogs. It should be noted, nine of last dozen at Progressive Field between these teams have gone UNDER. This is ESPN contest, which starts at 7:05 Eastern and if you follow baseball on the days of the week, New York is 5-13 in last 18 Monday affairs and the Tribe are 11-4 on the first day of the work week.